Szeged’s urban development concept and integrated urban development strategy aim to improve the quality of green areas and to restore natural habitats and ecological corridors for social and recreational purposes and to mitigate the impacts of climate change. Due to the required structure for integrated urban development strategies and related financing mechanisms, there are separate objectives and plans for most urban districts (Liget, Mórapark, Makkosháza, Odessza, Roosevelt square, Tápé, Tarján, Stefánia, Vértó). They are called action areas and are developed in relation to the general objectives of increasing the number of green areas and their renewal. By 2020, these green interventions under the action areas will be connected, creating a complex green area network in the city. Objectives under the complex development of action areas include, for instance, the rehabilitation of green areas, review and expansion of urban mobility (upgrading the cycle path system, extending public transport with green investment) and a decrease in concrete surface area. These challenges are addressed by various nature-based solutions, such as urban renewal with green areas, including the selection of climate-adapted vegetation, water- and air-permeable cover usage, and the creation of urban garden allotments. These nature–based solutions form part of a strategy for improving resident mobility, the multi-functionality of public spaces, and local economic development. Green area rehabilitation and restoration projects have been completed in the Liget action area and in various parts of the city (e.g. Széchenyi square). Similar actions are planned in the remaining eight action areas by 2020. There is a special focus on creating connectivity between the action areas, therefore enhancing biodiversity and ecosystem services and on developing social spaces for all age groups (playgrounds, benches for resting and sitting, dog-walking areas, sport areas, cycle paths). The city also addresses adaptation to climate change and increasing climate resilience for instance by using adaptive, multi-level vegetation. Decreasing car use and encouraging sustainable urban mobility is another crucial objective for Szeged, with special attention paid to the extension of cycle paths, which often goes hand-in-hand with extending and conserving green areas. When expanding the public transport system, green investment is considered, as was the case in the 2006-2015 upgrade of tram lines, where grass was planted between the tram tracks. Furthermore, the city centre is restricted for pedestrian use only and recently, to address growing pressure to increase green areas, a new city ordinance declared that new properties built do not need to include a parking lot. The city also uses water and air-permeable coverage whenever possible and removes concrete covers that are out of use. There is also focus on the renewal of housing estates using nature-based solutions to support social changes by making the areas more attractive for younger generations as well (e.g. urban gardening, parks, outdoor leisure activities). The city authority focuses on nature and sustainability. However, as local authorities have limited own budgets, EU and national financial sources are very important. Most investment in nature-based solutions came from an EU funding source, mostly operational programmes (only one action area, Tápé, has been rehabilitated entirely from the city administration budget). Therefore, information about EU funding mechanisms and operational programmes for green infrastructure, nature-based solutions and green areas is crucial for any such developments in the future. Another key lesson was learned during the 2006-2015 expansion of community transport in Szeged, when there were many discussions on how to finance the expected high costs of maintaining the grass between the tram tracks as maintenance is usually not supported by EU funds. In fact, the costs have not exceeded the planned budget and can be managed by the city, which shows that more knowledge and experience are needed to make more exact calculations and better project planning possible. One of the key remaining challenges is liaising with all stakeholders and addressing their various needs, which requires extensive discussions. Most activities are financed from EU financing mechanisms, including PHARE 2000-2003, and operational programmes (2004-2006, 2007-2013, 2014-2020 and the currently planned territorial operational programme that contains priority axes for green infrastructure development). 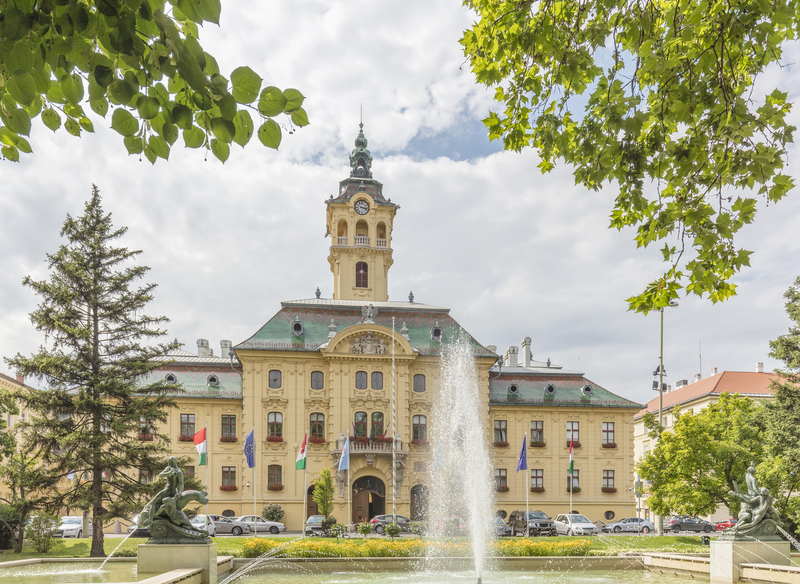 There are plans in Szeged for a joint Hungary-Serbia application from the Instrument for Pre-Accession Assistance (IPA) for improving water management and rainwater use for local gardening. All activities include at least 5-10 % co-financing from the city; there is one project in Tápé that is financed solely from the city’s budget. The city administration has a department that runs 60-70 parallel projects and there is a goal to increase its capacity.